What Are Some Reasons to Get Pergolas Installed? In the summer, you might want pergolas to protect you from the blazing sun or the pouring rain. Although there are only a few weeks left of summer, there’s still time to enjoy all that warmth and sunshine. Even as September approaches, Maryland days and nights will still be humid and stormy, making a covered outdoor space even more attractive. Consider these reasons to get pergolas installed for your backyard. Do you already have a deck or a patio in your yard? If you do, you probably had one of these features installed so you had more room to spread out. But in the summer, the weather can be unpredictable. So you might want to choose pergolas to protect you from the blazing sun or the pouring rain. Take cover under the shade and enjoy the sound of the rain while you curl up with a book and a drink. With an abundance of design choices available to you, it can be hard to decide what you want. The first decision you’ll have to make is whether or not you want a custom-built pergola or a stock design. A stock model won’t provide you with as many options for your design, but assembly and installation are much easier. Pressure-treated wood: If you’re on a tight budget, pressure-treated wood is a decent option. They’ll last a respectable length of time, but you will need to maintain them frequently to keep them in their best shape, since this type of wood can start warping, cracking or checking once they get old enough. If you do choose this type of material for your pergola, make sure to keep them painted or stained to improve their appearance. Cedar: Cedar is another excellent choice for pergolas. Not only is this type of wood naturally resistant to insect attacks, but it looks great right after being sawn. While using cedar for your pergola can be more expensive, the extra cost is worth it due to the improved durability of this wood. Vinyl: Vinyl is a fantastic choice of material for pergolas, especially if you’re looking to have something that’s low-maintenance. Vinyl pergolas are harder to paint though, so you might have fewer choices for the colors you can use. Fiberglass: Although fiberglass is the most expensive pergola material, they compensate for it with their long-term durability. You can build a bigger pergola with fewer support posts needed, and any color you want for your fiberglass pergola, you can have. Fiberglass pergolas are also light enough that they can attach to your current deck or patio without adding too much weight to your existing structures. 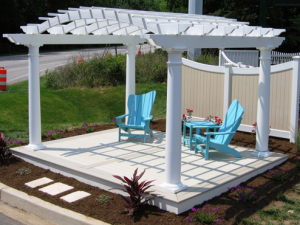 Mid-Atlantic Deck & Fence Can Help You Design the Pergolas You’ve Always Wanted!